If there is — or ever was — life on Mars, it may be related to us. In fact, life on Earth may have been seeded by alien microbes that traveled here in chunks of rock blasted off Mars by asteroid impacts. That's the idea motivating MIT's Chris Carr and his colleagues, who are developing an instrument that would detect Earth-like life on Mars. Called the Search for Extra-Terrestrial Genomes, or SETG, the device would scan samples of Martian dirt, looking for the stuff of Earth life — the nucleic acids DNA and RNA. A flight-ready version of the SETG might be ready to go by 2018. That could make the device a candidate instrument for the ExoMars-MAX-C mission — a joint European-U.S. effort that would drop two rovers onto the Martian surface — which is scheduled to launch that same year. SPACE.com: What are you guys doing differently than other researchers who are thinking about looking for life on Mars? MIT scientist Chris Carr is helping develop an instrument that would detect Earth-like life on Mars. Chris Carr: I think a lot of the astrobiology community has opted to try to develop strategies to look for life that are not Earth-centric. And our approach is to say, Well, if we think there's a chance that we could be related, we should at least be looking for life that's similar to us. SPACE.com: How did you and your colleagues get interested in this idea? Carr: The reason that we're doing this now — and people have not focused as much on this earlier — is that, in the late '90s, there were some studies looking at how much material might have gone between Earth and Mars due to big meteorite impacts. And the calculated number is about a billion tons of rock. If we find that there is life on Mars, and it's related to us, it still doesn't answer how that life started. But it certainly gives us some perspective on our own origins. SPACE.com: If you do detect a lifeform on Mars, how would you know it's not just Earth contamination? Carr: One of the ways to do that is, you look at the sequence data, and you look for gene regions that are similar to the gene regions we know about on Earth that are common to all known life. You can actually line up the sequences, essentially, and you can ask, Is it similar or different? If we go to Mars and we get sequences, and they fit very deeply on the tree of life, that is much more compelling than if we go to Mars, we get sequences, and they look very close to, say, human. Or very close to B. subtilis, which is a bacterium that probably lives in spacecraft clean rooms, even though they're super-clean. So, that's going to be a test. What do we find and how does it fit on the tree of life? By making those comparisons — in particular, having a lot of sequence data — that would allow us to gauge if something is contamination or whether it's actual Martian life. SPACE.com: So how will this instrument work, when you've got a fully functional prototype? Carr: What we need to do to detect life on Mars, if it's there — life related to us — is isolate any nucleic acids, so DNA or RNA. Then we need to amplify and detect it, and then we need to sequence it. So those three steps. We've built a prototype instrument that will do the amplification and detection part, and what we're currently working on is building a miniature sequencer — the third part — and also the first part, the sample preparation. We're going to put it all together, with the goal being to have all of those pieces in place in the next couple of years. This 1 inch by 1 inch chip is part of the SETG instrument prototype. Tiny channels feed in the samples to be analyzed and control the fluidic circuitry on the chip. Blue light excites fluorescent dyes that help identify DNA within 3072 cubic chambers, each about the width of a human hair. SPACE.com: When will you likely have a flight-ready instrument? Carr: Probably the earliest time that we would be ready to be on a mission would be on like a 2018 mission. The goal is in the next couple of years to have an instrument where it's something that — it works on the bench, it's something we can take in the field and test in Antarctica, the Atacama Desert [in Chile] or some of the other sites that are typically used as terrestrial analogs of the Martian environment. We have to make a strong case that our instrument would survive the trip to Mars. SPACE.com: How big will this thing be? What will it actually look like when it's all put together? Carr: Right now our prototype of the middle part is about the size of a shoebox. And what we really need is for everything to be about the size of a shoebox. The smaller the better. Our target mass when this thing actually goes to Mars is a few kilograms. SPACE.com: You think you might be ready around 2018. Have you talked to people with the ExoMars-MAX-C mission? Carr: We haven't talked to ExoMars directly. I think it's just too early in the game for us to do that. As we've been talking, we're still putting the pieces together to make this possible. That would kind of be the earliest timing that we could do. So the Mars Science Lab [rover mission] is going to launch this year, and all the instruments for that are obviously selected, and already built, and delivered to JPL [NASA's Jet Propulsion Laboratory]. That one's going to have a drill that will get a little bit into the surface, like on the order of centimeters. But the 2018 mission is likely to have a drill that can get down deeper. Those are the kinds of samples that we're really interested in. Space radiation can be pretty harmful, and below about a meter you get a lot shielding from that. We think it's much less likely that we would find something on the surface or in the top centimeters than if we went down a meter or more. SPACE.com: This doesn't have to be a sample-return, right? Carr: This would all be done on Mars. But I would argue that it would sure be interesting to return samples if we found something. And maybe that's a good argument for putting this instrument on a mission where you could return samples. 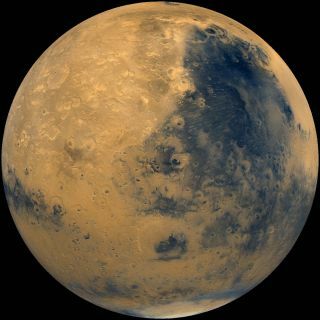 SPACE.com: If you do find Mars life that's related to Earth life, would you be able to get a good idea of when the split occurred — when Martian organisms colonized Earth, if that's what happened? Carr: "Good" is a very relative term. I think we're going to think about a split time in very rough terms. It's going to be constrained by how different the sequences are, and what rocks the organisms might be found in. I think maybe "good" is overstating it. But we're going to get some information about how they're related, and that will certainly constrain our thinking about how such a transfer might have occurred. But that’s putting the cart before the horse. First, we've got to get an instrument to Mars, and we've got to look for the stuff and see if it's there.